Home / Angler 119's Delaware River Fishing Report / You can't beat experience. Set out to fish earlier than usual today because I encountered cornutas yesterday. While they can and do hatch most anytime all summer, in the first week of June they can reliably be found hatching in the morning. Stopped to chat with my neighbor who was standing by the road. He asked where I was fishing today and I told him the Beaverkill. Just as I pulled away a Rhodes & Johnston flat bed loaded with three huge pieces of uncut blustone came across the bridge and started up the three mile hill to Route 97. Not wanting to spend half an hour inhaling diesel fumes I crossed the bridge and went up the Pennsy side. Stopped at Buckingham, as is my custom, just to see if anything was going on. Before I had even gotten to the launch ramp, I had seen half a dozen fish rise. Cornutas? Nah they were eating big yellow flies. Gray foxes were hatching and there wasn't a soul around to do anything about it except me. 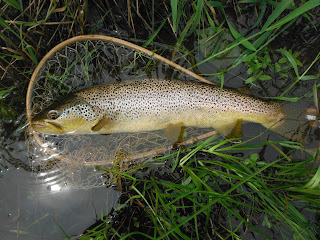 The hatch was over within an hour but during that time I hooked and landed five very nice fish. The one in the picture below is, at 21 and 3/4 inches, a serious candidate for fish of the year. When the hatch subsided I left and went to another BR spot. One that I had done very well at just two weeks ago. There were enough bugs to get the fish up but they weren't having any of mine. I counted ten refusals. The bugs and fish were just getting going good when the first (of what turned out to be many) thunderstorm hit. Sat on a stone on the bank for half an hour as the rain intensified and then walked out. A series of severe storms ended the days (and perhaps the weeks) fishing. Experience didn't play a part in your success, you say, you were going to the BK for cornutas and lucked into those fish on the BD. Ah, but what you don't know is that I have followed trucks laden with blue stone up the three mile hill before. So by changing my intended route my experience got me into the right place at the right time! It's always better to be lucky than good. Thanks, I enjoy your posts!